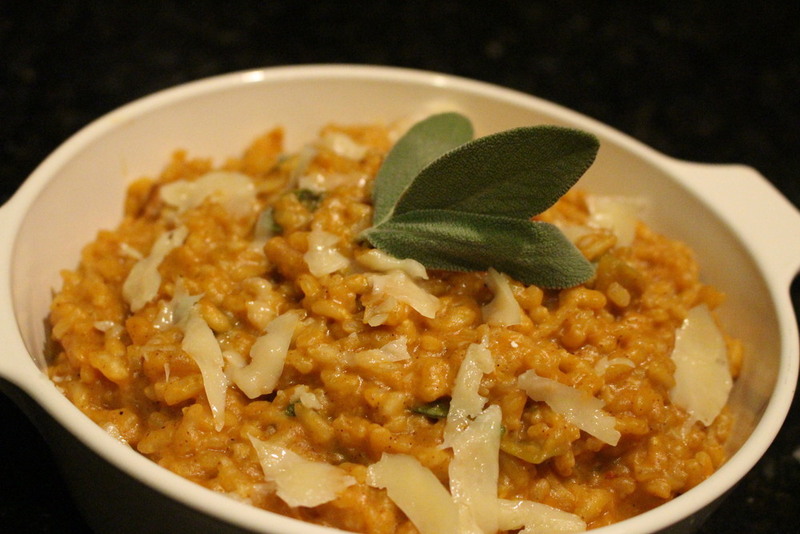 Oct 21 Pumpkin & Goat Cheese Risotto - For All You Pumpkin Obsessed. I've gotta say...this pumpkin craze has gotten a little out of hand. If I hear one more person talk about the Pumpkin Spiced Lattes from Starbucks - or worse - refer to them as PSL's, I may just rip my hair out. Even pumpkin beer is getting entirely too much credit. 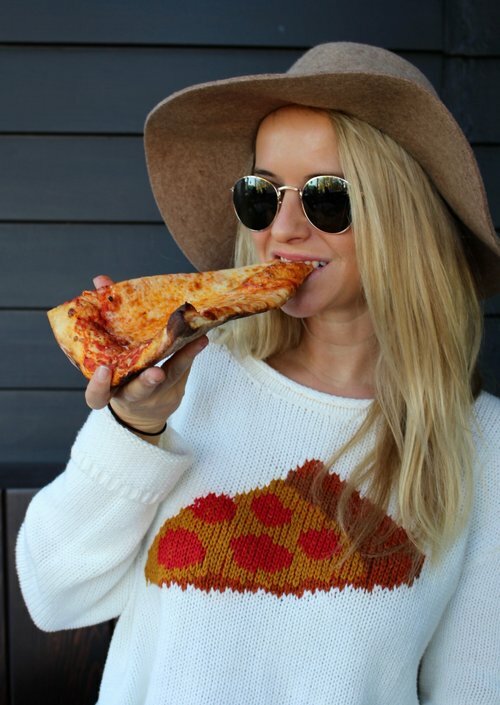 Chances are, if you're really into that overly sweet stuff, then you're probably not a regular beer drinker. My apologies...but it's true. While I love Fall and the flavors that often come with the season, I've found myself getting pretty annoyed with this ridiculous pumpkin obsession. Then I made Pumpkin Risotto. Perhaps I'm a hypocrite or maybe I just prefer the taste of the autumn squash in a rich, ooey, gooey pasta-like rice. I had been long craving risotto as it had been several months since I last felt like standing over the stove, and sweating...for nearly an hour on end. Oh, risotto...how you make me slave for your decadence. On this night, I was feeling quite motivated and was also salivating at the mere thought of the beloved Italian dish. 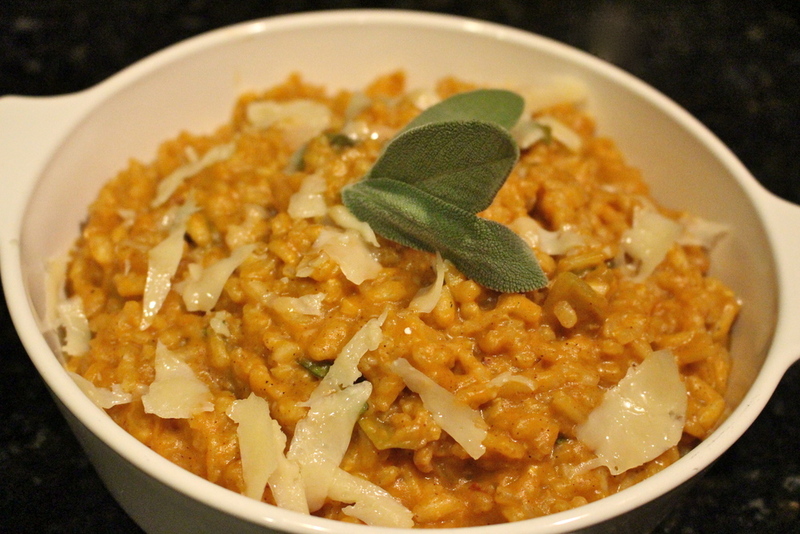 The last few Thanksgivings I've made a luscious Butternut Squash Risotto. And while I'll hesitatingly admit that I like both my Butternut Squash and Wild Mushroom risotto recipes a bit more, this Pumpkin version is pretty rightoeus - especially if you're a serious lover of the orange mush. So go on ahead and give your legs and your arms a good strech and grab a large glass of wine. You may want to give those knuckles a good crackin too. You're about to be standing....and stirring....for at least 45 minutes. But friends, it is so worth it. That's a promise. 1. In a medium saucepan, heat the chicken broth on low for 5-10 minutes. 2. In seperate saucepan, bring olive oil to medium heat. Add shallots and sautee until translucent. Then, add the minced garlic and stir for one minute. Season with a sprinkling of salt. Next, add the Arborio Rice and "toast" for 2-3 minutes. Add the white wine and allow the rice to completely abosorb it. 3. Using a soup ladle, add the chicken broth to the risotto- just one ladle at a time, allowing the risotto to completely aborb the liquid each time. Once it has aborbed all of the broth, add another ladle worth of broth. Continue with this process for about 30 minutes or until rice is complely cooked to your liking (I like mine al dente but some people prefer risotto a little more soft/gummy). It's okay if you don't use all of the broth. And if you think you'll need more, just add some water to the pot of broth. 4. Once cooked, add the puréed pumkin, butter, salt, pepper, nutmeg, goat cheese, and parmesan cheese. Stir until all ingredients are combined. 5. Finish it off with 2 teaspoons fresh thyme leaves or 4 chiffonade cut (thin slivers) sage leaves. Garnish with more herbs along with some shaved Parmesan and serve.